South Africa, July 2014: South African brandies have again emerged as world champions having taken top honours in this year’s International Wine and Spirit Competition (IWSC) as well as the International Spirits Challenge (ISC). These two competitions are seen as the most authoritative on the international spirits scene. 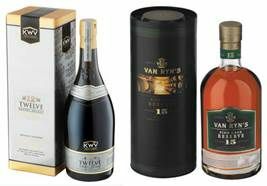 The IWSC trophy was won by the KWV 12 Year Old while the ISC trophy went to the Van Ryn’s 15 Year Old Fine Cask Reserve. Reflecting on the most recent show, respected IWSC judge Dave Hughes said one cannot fail to appreciate the dominance of South African brandy. “There were entries from France (other than Cognac and Armagnac), Spain, Italy, Germany, Australia, USA, Armenia, Mexico, Portugal and India,” he says. Once whittled down by the international panel of experts however, it turned out the shortlist contained only South African brands. “Anyone of them was a worthy trophy holder,” Hughes says. “Once again a South African brandy has won the coveted IWSC and ISC Worldwide Best Brandy trophies – this is proof that our exceptionally high production standards are consistently producing brandies that are being recognised internationally by the highest qualified judges to be the best,” says South African Brandy Foundation director Christelle Reade-Jahn. Commenting on KWV’s achievements, master distiller Pieter de Bod said: “To win Worldwide Best Brandy 2014 is the highest accolade and demonstrates our brandy team’s commitment to innovation and quality of the highest standard. Van Ryn’s Master Distiller Marlene Bester highlighted the distillery’s consistency of excellence, which includes winning the ISC Best Brandy trophy four times. “This is the most any South African brandy producer has achieved over the past 10 years,” she said. Winning the 2014 Best Brandy trophy at the ISC is a true reflection of our meticulous attention to the quality and detail of our brandies. By bringing both these trophies back to South Africa shows that South African brandies can stand its own in the international brandy arena. The quality of South African brandy is underpinned by some of the most stringent legislation in the world. Our brandy must be distilled twice in copper potstills and aged for a minimum of three years in oak casks. Legislation allows for three styles of brandy: potstill, vintage and blended. All three styles feature regularly at international competitions.